Are you looking for a way to escape the tensions of modern life? Do you want to do something that's not only enjoyable, but also challenging and satisfying? Try building and flying R/C model airplanes. 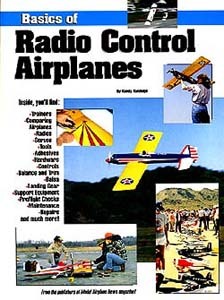 This book contains information from "The Basics of R/C," which is a column I write for Model Airplane News magazine. You'll find basic information on how to get started - everything from the selection of an airplane to how to maintain and repair it. All the techniques outlined apply to scratch-building and to building with kits, and although aerodynamics is beyond the scope of this book, there are some rule-of-thumb-type calculations that you might find useful. Building the most complicated model is a combination of many small tasks; some are as simple as cutting a piece of wood to the proper length; others are more difficult - but less difficult when you know how. I hope my years of modeling experience will help you get airborne quickly, and with minimum frustration! Who knows? This book may change your life! This book is available, please post in this thread if any member is interested in borrowing. Is this available? Would like to borrow this book, able to collect weekday this week.